Freedom and Flourishing: Do well-being indicators all tend to tell similar stories about OECD countries? Do well-being indicators all tend to tell similar stories about OECD countries? In my last post about the OECD’s ‘better life index’ I suggested that although all well-being indicators tend to tell similar stories when wealthy countries are compared with poor countries, they may tell different stories when wealthy countries are compared to each other. If we think of the OECD as a rich nations club we might expect a great deal of variation in the stories conveyed by different well-being indicators. For example, some countries might be expected to put emphasis on health and leisure, and others to put emphasis on income and housing. However, the view of the OECD as a rich nations club is actually difficult to sustain - there is a substantial amount of variation in wealth among the countries that are now members of the OECD. So, do all well-being indicators tend to tell similar stories in OECD countries too? My first step in looking at this question was to look at the correlation between the various ‘better life’ indicators in the OECD. 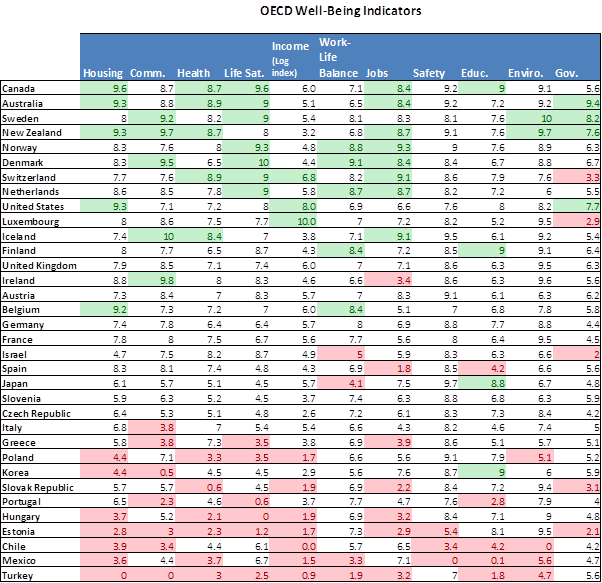 In the following table the various indicators are ranked from left to right in terms of the extent to which each is correlated with the other well-being indicators. The correlation between housing, community, life satisfaction and income tends to be higher than for the other indicators. Does the weighting system used to rank countries in the table have any greater validity than the range of weighting systems that I looked at in my last post? I’m not making strong claims. My attempt to derive weights without making explicit value judgements might have some merit if we view well-being as analogous to a syndrome with various indicators corresponding to symptoms. If an indicator is not highly correlated with the other indicators it may not be an important component of the well-being syndrome. Alternatively, it is possible that indicators that are not correlated with other indicators might not be well constructed. For example, the OECD’s governance indicator seems somewhat lacking by comparison with the World Bank’s governance indicators. The OECD’s governance indicator does not seem to include measures of levels of corruption or quality of public administration. After ranking countries, the next step was to highlight countries that have exceptionally good or exceptionally poor performance in terms of particular well-being indicators. For the purposes of the table, exceptionally good performance (highlighted in green) is more than one standard deviation above the mean and exceptionally poor performance (highlighted in pink) is more than one standard deviation below the mean. It is clear that the countries ranked highly in the table tend to have a higher probability of exceptionally good performance on most of the indicators and that countries that are ranked towards the bottom tend to have a higher probability of exceptionally poor performance. Well-being indicators do tend to tell similar stories in OECD countries. One of the stories that the table doesn’t tell us directly is the difference in past history of the countries with relatively high and relatively low well-being ranking. The incomes of some of the countries with relatively high rankings are not particularly high, but good housing is presumably indicative of their past history of relatively high incomes. This seems to highlight the importance of the distinction between stocks and flows. Current well-being seems to be more closely related to stocks – wealth, human capital, social capital and environmental capital – than to income flows. However, we should not neglect the important role that income (economic growth) plays in the accumulation of wealth and human capital and the important role that stocks of social capital (particularly interpersonal trust) along with institutional capital (economic freedom) play in promoting conditions for ongoing economic and social progress. Another great article - I'm glad this rain is keeping you at your desk! I've lived in 3 of the countries listed in the table and have upgraded each time (UK to Luxembourg to Australia), according to the OECD ranking. However, based on my experience, I do wonder what these numbers really mean. If I had to rank each of these criteria on gut feel, I would have ranked Luxembourg higher than Australia on housing, health, education (very surprised with this result), safety and gov. I wonder how population also affects the score. For example, Luxembourg has a tiny population and therefore probably doesn't require the same level of bureaucracies of other nations. I found it to have the best level and respected level of governance of all three. I am also surprised at the seemingly high scores on education and environment (those figures have to be fudged) attained by Australia. Canada, watch out. Here we come! Just a post script to my earlier comment. When I lived in Luxembourg, you could only do first and maybe second year University studies. Perhaps this is why their education score is low. This is no reflection on wealth or commitment to education, but a reflection of demographics and the proximity to Universities in Belgium, Germany and France. The government was seeking to change this based upon the massive increase in population brought about by the expansion of the EU. Thanks for reading, Shona. The sun must shine again soon - after all, we live in the 'sunburnt country'. I don't want to seem to be an apologist for the OECD staff - so I will resist the temptation! Actually, I think they do deserve a little bit of sympathy because it isn't easy to derive good well-being indicators. I was also surprised by the results for Luxembourg. Population size shouldn't affect the results. Re housing, the indicators used were rooms per person and indoor toilets. Average rooms per person is apparently lower in Lux than Aus (McMansions rather than apartments?) and some houses in Lux apparently still have outside toilets (that must be a bit of a challenge on a cold night in that climate!). The results for education are very surprising. The two indicators are average education attainment of the population and student reading scores. I would have thought those indicators would be pretty reliable. Lux apparently has low scores on both. I don't think the factors you mention re education would explain the result. I would have expected the high incomes to require high levels of education - and educated people tend to put a strong emphasis on developing reading skills of their own children. I think good environment indicators are particularly hard to find. The OECD uses just one indicator - particulate emissions (PM10). That stuff is particularly nasty and harmful to health. Are there better indicators that they could be using regarding the impact of environmental factors on human well-being? In their shoes I think I would be tempted to use a subjective indicator from the Gallup World Poll. You might be interested in my somewhat cheeky comment here on the 'happy planet' index. Shona, I also considered environmental indicators here. It is really hard to know what environmental indicators are best.